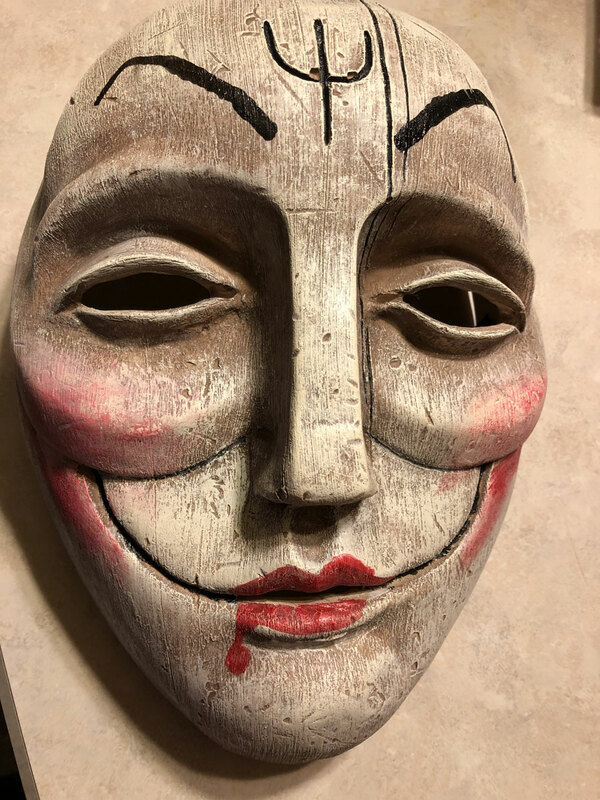 Help identify a mask. India? A: I found this mask to be quite interesting. The material of construction is unrecognizable, none the less, it is well made and something that is authentic tribal art. 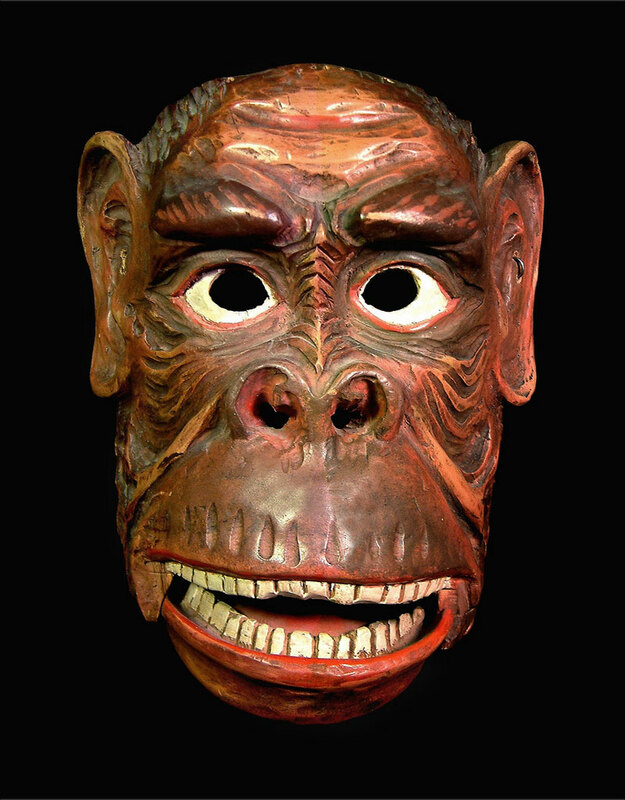 Once I saw a heavy wood mask from southern India that looked much different but had the same pitchfork symbol on its forehead. Is the red character on the left rear a clue? 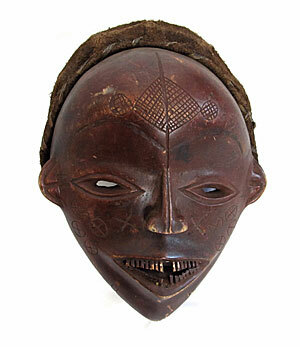 Otherwise, this mask is a total mystery to me. Incidentally, Marion didn’t leave a correct email address so I could not ask her the usual what, where, when and how much. Please enlarge the photos and comment if you can give us even a little help. 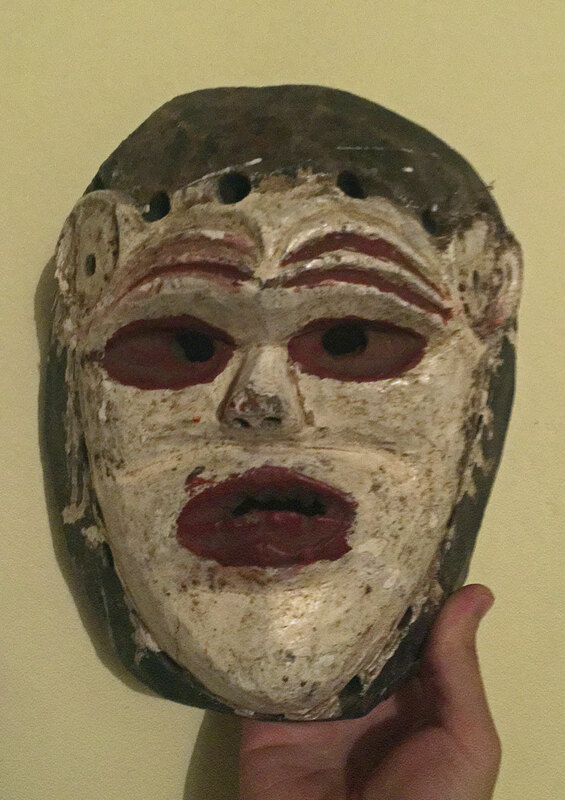 Mexican decorative masks, collectible or not? 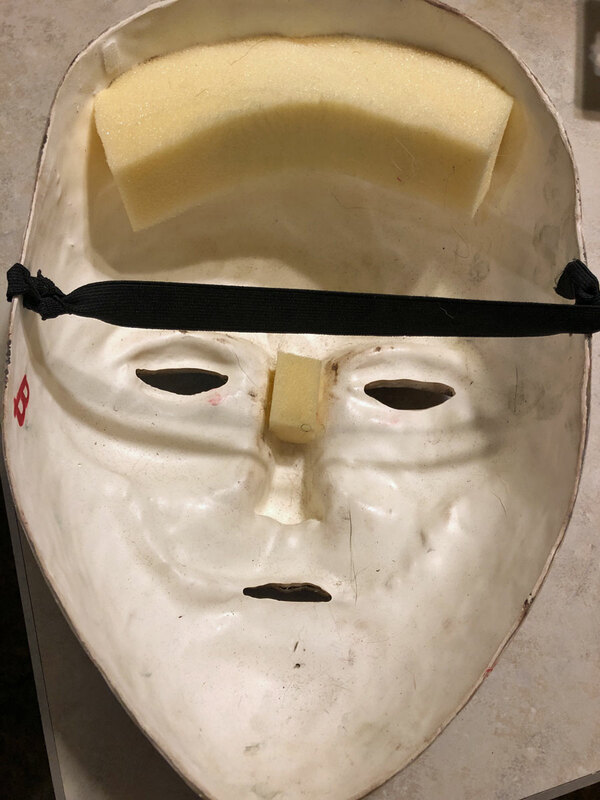 What we can say, for sure, is that this mask is really recent because the material looks to be a kind of resin or another polymer. Only these materials allow such a thin structure. These materials require a specialized and specific technology to be manufactured. Therefore, I would not think to a craft object, but rather an “industrial” one. It could be usefull to know where it comes from…Marion does not give a lot of details ! How Jean already mentioned, the mask looks made of resin or another polymer. Face designe looks like combination of different movie cliches: perfect lipstick with blood-mark, smiling scar, the skin should look like an old wood with black-painted cracks. The fork mark could be letter psi, common symbol for psychology. Maybe I´m absolutelly wrong, but altogether I would say it is a modern Halloween mask, possibly based on some movie character (try to google “purge god mask”). I just found this by chance, conferming what I said above…Price 59$90. Industrial stuff. 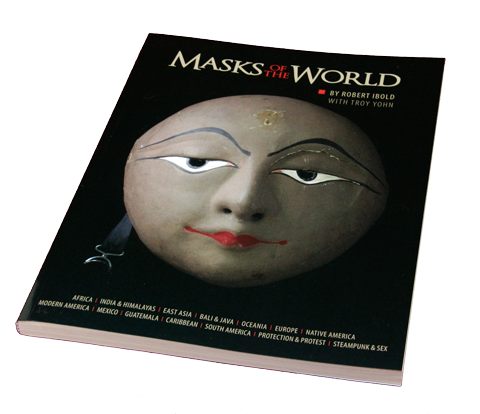 Take a look at the website below, with the same mask pictured for sale. A mystery solved 😎 ! The officially licensed Dark Elf Gluggagaegir Halloween Mask from the new Christmas Classic, Michael Dougherty’s Krampus. 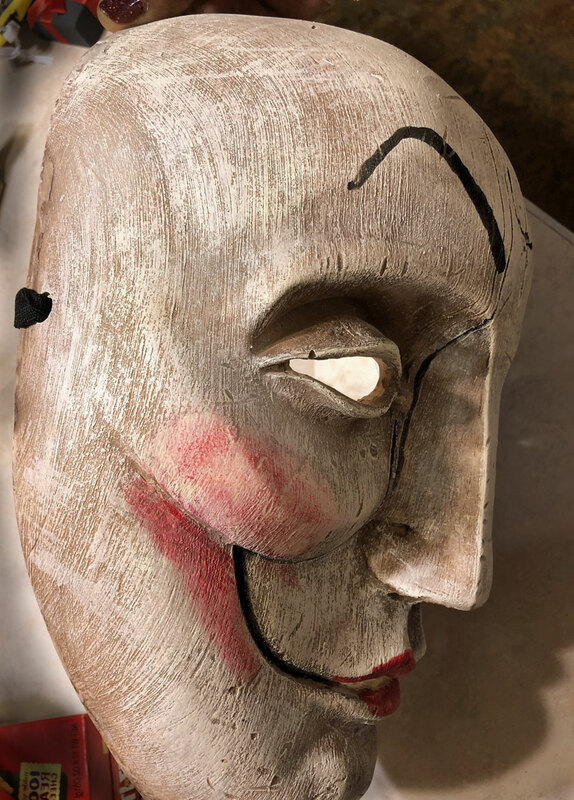 This amazing mask comes directly out of the screen used Resin Masters, which were provided to Trick or Treat Studios by Weta Workshop and finished by our Art Director, Justin Mabry. The Dark Elf Gluggagaegir Halloween Mask is made from a Resin and comes with an attached strap and foam for the perfect comfort and fit. So pickup our Dark Elf Gluggagaegir mask, as well as our other Dark Elf Stekkjarstaur and our Krampus Movie Mask so that you and your friends can be the ultimate Anti-Santa this Halloween. And congratulation to Evka who was right when guessing about a modern halloween mask !